Tom is absolutely right. And, he’s been so right for so long that he certainly doesn’t need my validation. But, I’ve been blessed to hear Tom speak to a small group of executives (~20) from one of the organizations I worked for. I say blessed because Tom is phenomenal in front of thousands of people. There are no adequate words to describe the power of his message in a small group except, possibly, astoundingly phenomenal. He deftly cuts through the chaff that permeates most organizations’ discussions about obstacles to improving performance, presents a compelling case for selecting and focusing on the right priority, and astutely leads the audience to the undeniable truth about the effectiveness of actionable steps (as opposed to nebulous ideas about far-off improvements). The key point is that the difference between exceptional and exceptionally exceptional performance in the world’s inarguably ultimate test of athletic prowess (The Olympics) is one percent! Sometimes it’s slightly less, sometimes slightly more. But on average, the gold was taken by an exceptional performer by less than a one percent margin over the fourth place performer. These data have been validated by multiple studies by completely unrelated experimenters. Ken powered down his computer at the end of the day and took a moment to sit back in his chair. It had been another productive day. Looking out into the hallway, he smiled and waved goodbye to one of his colleagues on her way out the door. It was great to have people around him that he could work with effectively. His eyes turned to the award he’d just framed and hung on the wall, next to several others. He remembered how sweet it was to get each and every one of those awards – and the promotions and respect that went hand in hand with them. He took a satisfied, deep breath. He could honestly say he was a happy guy, that he was on top of the world. The difference between exceptional and exceptionally exceptional is one percent. You can’t be 100% better than everyone else, but you can be 1% better at hundreds of things. You may not win all the time, but you can have a winner’s heart if you do something better today than you did it yesterday. Not everyone can be great, but everyone can be better than they are right now. Aim to be swifter, higher, stronger – not swiftest, highest, strongest. The key takeaways from the final chapter are the measured rate of change is dependent on several factors, particularly whether you’re measuring over days, weeks, or months, and whether you’re measuring the change in actions or in the outcomes of the actions. Define the goals, identify the actions, commit to the incremental improvements, and share the wealth with others. 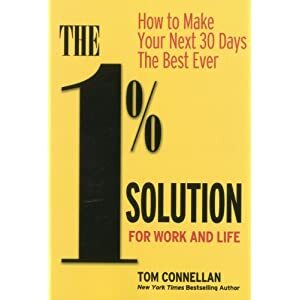 When companies such as Marriott, FedEx, and Neiman Marcus want to take their performance to another level, they all turn to one man – Tom Connellan. And with good reason. He’s solid. Every year, he keynotes scores of meetings. A former program director at the Michigan Business School, Tom brings depth and breadth to your conference. As a company founder and former CEO, he knows firsthand what it takes to grow a business. Tom started a service company in the health-care field and built it into a network of 1,200 instructors serving 300 hospitals and most of the Fortune 500 firms. More than 1,000,000 participants went through the programs, and two different Surgeon General reports cited the firm’s program quality. Tom knows what it’s like to be on the firing line of business, because he’s been there. Tom is the bestselling author of ten books and numerous articles. He’s been the editorial director of four management and human resource magazines. Tom brings solid content and a passionate delivery style to his presentations. He captures the audience’s attention and holds it from start to finish. Selling Power magazine named him one of seven “Tough Talking and Truth Telling” keynote speakers. I’m so convinced Tom’s book is worth reading and that it directly contributes to the message that I want to convey, that I’m including a purchase link below (which I rarely do) and adding it to the site’s Worth Reading list. You can obtain Tom’s book via the link below or in bookstores. Now, go improve something and have fun doing it! This is a great review. I have been following several of the principles, but wasn't sure where they started. I think I'll put this book on my summer reading list. Hi, Kim! Thanks! I'm glad you found the review useful. I definitely think you'll enjoy the book. It's an easy read, but it has a wealth of benefit contained in its pages.